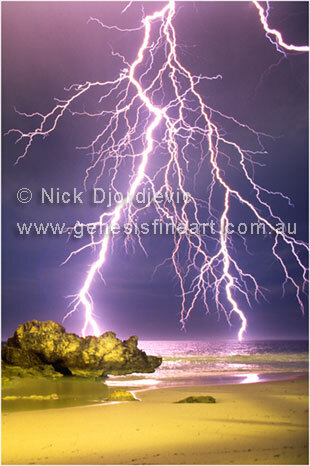 This lightning photo is titled "Sky Show " and was taken overNorth Beach which is located in the northern coastal suburbs of Perth, Western Australia. The lightning strike was photographed with a 24mm wide angle lens and the length of the exposure for this lightning picture was about 40 minutes. This is a vertical crop of the previous image titled Sky Show.